Find out what simple cosmetic dentistry can do to help! Our teeth start out white, but they naturally change color due to aging and with everyday use. While teeth typically grow darker and begin to yellow at around age 30, this can happen much sooner without proper brushing, flossing, and regular dental checkups to remove buildup. Part of this process is strictly physical. Teeth, like bone, are complex—part living and changing, part fixed in time. The hard outer layer is enamel, rich with calcium, and it’s our first defense against injury and decay. Beneath enamel is the dentin which composes the main mass of a tooth. The enamel is translucent, a shade of blue in tone, while the dentin has a yellow hue that shines from within and gives teeth their unique appearance. When enamel thins, the darker dentin color eventually takes over. Add to this scenario a diet of coffee, tea, cola, and/or smoking, and you can see how our teeth are constantly exposed to potential stains and color change. Fortunately, we can help you regain a white, natural-looking smile with just some simple cosmetic dentistry! Call us today at (518) 273-0089 to schedule a consultation. Tooth whitening – We create a custom set of whitening trays for at-home treatment at your own convenience. 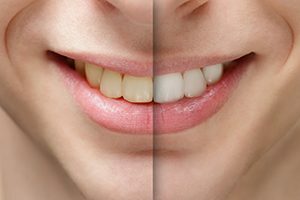 Porcelain Veneers – We can remove the outermost layer of enamel from the front of teeth, we then add a new thin veneer of porcelain ceramic that can completely change tooth color and appearance. Cosmetic Bonding – Composite bonding resin can be used to fix or hide imperfection such as cracks, chips or discolorations.